This afternoon I visited the exhibition of works by George Bellows at the Royal Academy of Art in London. An American artist during the first few decades of the twentieth century, Bellows is well-known for his paintings of boxing matches. Today I learned that he was an artist who was greatly concerned about a range of issues that fit squarely within the frame of human rights. 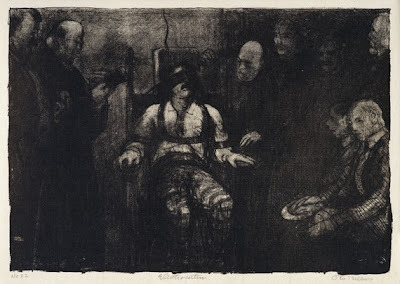 Several of his works on human rights themes, including atrocity in wartime, capital punishment and lynching, are on display at the Royal Academy of Art. 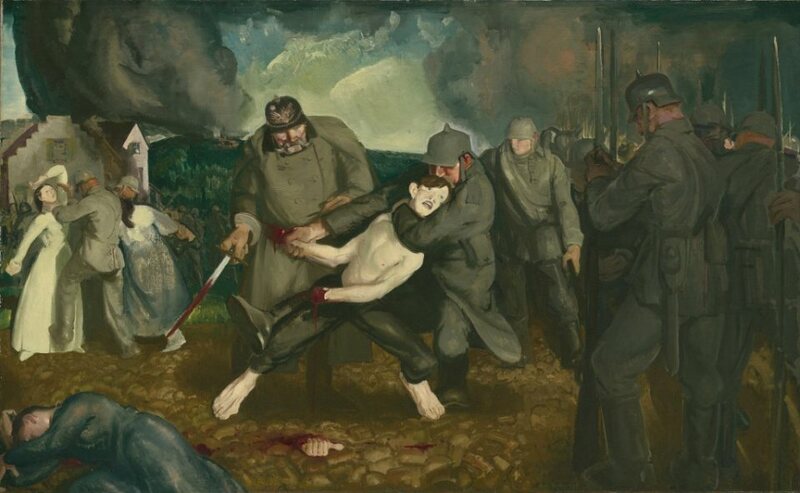 There is a series of large canvasses dealing with atrocities perpetrated during the invasion and occupation of Belgium by Germany during the First World War. One of them shows a young man having his hands chopped off. 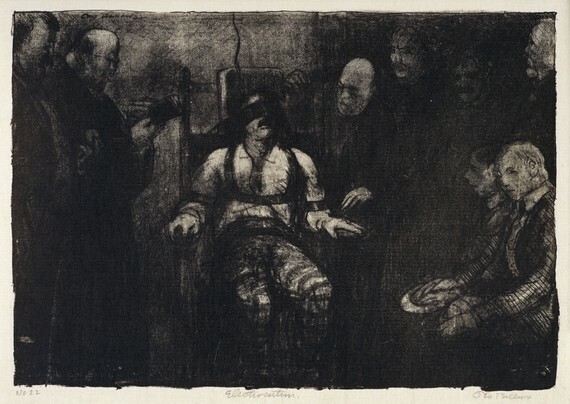 There is a dramatic lithograph entitled 'electrocution'. 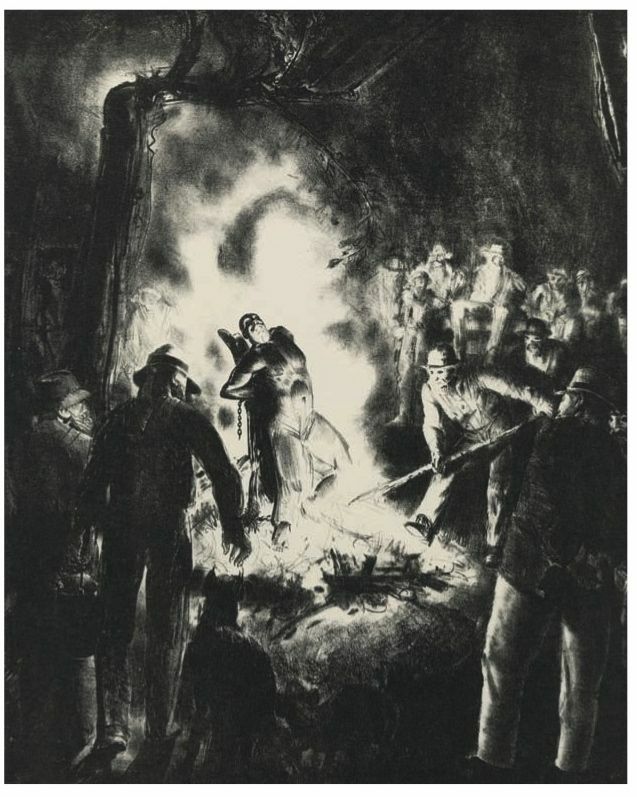 There are also two slightly different versions of a print showing the lynching of an African-American entitled 'The Law is Too Slow'. For a fabulous, original approach to international justice, have a look at the recent report prepared by Daniel McLaughlin for the Leitner Center for International Law and Justice at Fordham Law School. 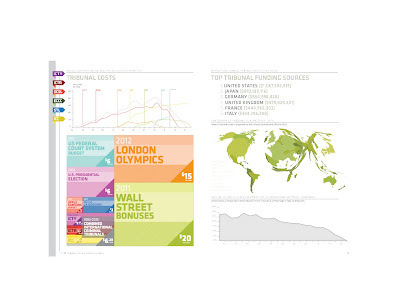 Using very sophisticated graphics, this publication aims to engage a wider audience with issues of international justice by presenting well-researched information about the tribunals and their underlying conflicts through a novel partnership with graphic and information designers. Below is an example that presents the costs of the tribunals. Like a shot out of the dark, Israel has been taken to the International Criminal Court by Comoros. Yesterday, Comoros submitted a referral in accordance with article 14 of the Rome Statute concerning the Israeli attack on the so-called Gaza Freedom Flotilla in May 2010. The referral letter is available on the Court's website. In the days and weeks to come, there will be much chattering on the blogs and in law journals about the legal details. Is the referral admissible? Does it meet the gravity threshold? What about complementarity? Should the Prosecutor invoke the ‘interests of justice’ and decline to proceed? But ultimately, like all of the other decisions to proceed or not to proceed with an investigation, politics will determine the outcome. Judging by the history of the Office of the Prosecutor, any contrived technical argument will suffice in order to avoid the Court addressing the situation in Palestine. Because everybody knows that the Prosecutor is terrified to deal with the situation in Palestine. It risks upsetting the increasingly cordial relationship between the Court and the United States. The Comoros referral has some intriguing and unique legal features. Like previous applications of article 14, it is a ‘self-referral’. Comoros is referring a situation that took place on its own territory. The MV Mavi Marmara, where the main attack took place, is a Comoros vessel. In accordance with article 12 of the Rome Statute a ship flagged in Comoros is deemed to be part of its territory. But as the referral makes clear, Comoros is referring the situation on its own territory because of the acts of another State. In that sense, it is really the first referral directed by one State against another. And it is also of interest because although Comoros is not and cannot charge Israel with the crime of aggression, the referral is entirely related to an aggressive act by one State against another (and in which the alleged aggressor will, of course, claim to have been acting in self defence). In her statement yesterday acknowledging the referral, the Prosecutor indicated that she will now consider whether or not to initiate an investigation. There is no obligation on the Prosecutor to proceed. No referral, whether it is by a State party or by the Security Council, compels the Prosecutor to proceed. In practice, the Prosecutor has accepted every referral to date. This is likely to be the first referral that the Prosecutor refuses. Should she decide not to investigate, article 53 becomes operational. It entitles Comoros to seek revision of the Prosecutor’s decision by a Pre-Trial Chamber. That too would be a first for the Court, because there has never before been such a proceeding. We do not know how the judges will interpret article 53. But we have some hints, because the nature of the revision is quite similar to what is contemplated by article 15, when the Prosecutor seeks authorisation to investigate a situation. Decisions by the Pre-Trial Chambers pursuant to article 15 indicate a very deferential and permissive attitude. Judges have been very reluctant to attempt to second-guess discretionary decisions by the Prosecutor with respect to priorities of prosecution. We can expect something similar if this case ever gets to the article 53 stage. The Prosecutor does not need the referral in order to address the situation in Palestine. The Prosecutor can exercise jurisdiction over the territory of Palestine since 1 July 2002 as a result of Palestine’s declaration of January 2009. Although no official statement has been issued, it seems that the Prosecutor does not consider the January 2009 declaration to be effective. Readers will recall that after studying the Palestinian declaration for more than three years, the former Prosecutor issued a statement saying that the issue of whether or not Palestine was a State was to be determined by the General Assembly and not the Prosecutor. The General Assembly recognized Palestine as a full observer State in November 2012. The Prosecutor does not seem to dispute the fact that recognition by the General Assembly resolves the issue of Palestinian statehood for the purposes of article 12. But the position she is taking by which a new declaration is required is based on the erroneous proposition that Palestine became a State when the General Assembly admitted it in November 2012. The General Assembly resolution provides confirmation that Palestine was a State. Under general principles of law, statehood is determined according to several criteria, but membership, whether as a full member or observer, in the General Assembly is not one of them. Taking the position that Palestine must issue a new statement is just one further example of the Prosecutor’s desire to avoid having to deal with the substance of the situation, something driven by the political perspective mentioned above. The most famous and important of the observer states is Switzerland. It was admitted by the General Assembly in 1948 and remained in that status until becoming a Member State in 2002. Would the Prosecutor consider that Switzerland was not a State prior to 1948? The General Assembly admission of an observer state is simply a fact to be weighed when assessing if an entity really is a State in accordance with article 12. Switzerland didn’t need observer status in the General Assembly in order to become a State. And perhaps one of the other observer states, the Holy See, isn’t really a state at all, despite recognition by the General Assembly. Even if Palestine were to submit a new declaration, the Prosecutor might very well deny it any retroactive effect. She has not yet taken a position on this. But given her anathema to things relating to Palestine, I would expect her to claim that Palestine can only give jurisdiction to the Court from November 2012, when it ‘became’ a State according to the reasoning her Office appears to have adopted. This would be a very perverse position. Because if Palestine cannot give jurisdiction over its territory back to 1 July 2002, then who can? Surely not Israel, because we are talking about occupied territory. Is it really thinkable that the Prosecutor would recognize what would be, in effect, a black hole that is immune to the jurisdiction of the Court? This cannot be consistent with the object and purpose of the Rome Statute. The flotilla events are probably the weakest basis for Palestine-related prosecutions at the International Criminal Court. The best focus for the Prosecutor – and something she can do on her own, without any referral, and by acknowledging the validity of the January 2009 declaration – is an investigation into the ongoing settlement policy of Israel. It is unlawful in international law and a crime under the Rome Statute. A decision by the Prosecutor to investigate the situation of the settlements might help the world to address a situation of festering and intolerable illegality. And while it might anger a few powerful states, it would do wonders for the Court’s reputation in Africa and elsewhere in the Global South. Here's an interesting short film clip with a brief interview of Raphael Lemkin, the man who devised the word genocide. The conclusion shows Herbert Evatt, who was president of the General Assembly in 1948, announcing the adoption of the Genocide Convention. Please go to https://moocfellowship.org/submissions?discipline=2&language=en and cast your vote in support of the on line course I am proposing on human rights. There is a development fellowship available, offered by iversity and Stifterverband für die Deutsche Wissenschaf, but there are many contenders and it seems that the number of votes cast and Facebook 'likes' is important. Please urge your friends to vote as well. I thank you in advance for your support.